Looking for a pair of headphones that match brilliantly dynamic audio with high-performance sports functionality? Look no further than our collection of Jabra headphones. Jabra headphones are expertly designed to blend hard-wearing everyday practicality, ergonomically designed comfort and premium sound performance, making them the perfect match for anyone who enjoys the company of their favourite music or an engrossing podcast when they get active. 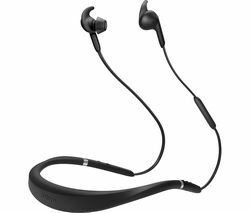 Headphones like Jabra’s Sport Pace are designed to make listening on the go as effortless as possible. For one thing, these in-ear headphones are wireless, meaning you can work out without the distraction of dangling cables. The Sport Pace Bluetooth headphones quickly charge to full in just two hours and if you're in a rush, a 15-minute charge will provide you with up to an hour of battery life. 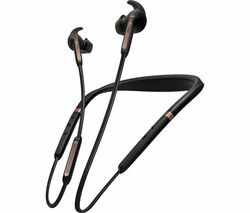 Fit is another important consideration if you’re on the lookout for workout-compatible headphones. Luckily Sport Pace come with three different size ultra-secure earbuds so you can find your perfect fit. The ear hook design and provided FitClip ensure they stay in place, no matter how tough your workout. And you needn’t worry about these hardy headphones standing up to the rigours of an action-packed workout. Tested to US Military Standards for weather and shock, the Sport Pace Headphones are IP54 rated, ensuring they are able to resistant sweat and the elements. Our Jabra headphones offer and array of next-level functionality that’s sure to enhance your workout. The Elite Sport wireless headphones even feature an in-ear heart rate monitor and integrated app to test and analyse your fitness. Alongside our Jabra collection, our extensive range of headphones includes the latest Bose, Sony and Beats headphones. And if your phones full why not see our Apple iPods and grab a dedicated music device.